You can create a quiz using a question group. Question groups allow you to place multiple questions within a group for students to answer. You can choose the number of questions that should be answered from the group and how many points to assign each question. Creating a question group randomizes questions within a quiz. Note: If you need your questions to appear in a specific order, do not place quiz questions inside a question group. Click the Questions tab . Click the New Question Group button . Give your question group a name . Quiz question groups are not automatically named for instructors. To add a custom name to your quiz question group, enter the name in the group text field. Custom names can help you identify quiz question groups more easily. Decide how many questions you want Canvas to randomly select from the group  and the number of points assigned to each question . If you want to link a question bank to the question group, click the Link to a Question Bank link. Note: If you set a question group to randomly select questions from the question bank, the question bank and questions will not be included in quiz exports. A QTI zip file will download the quiz details, but no questions will be included. To add individual questions to the group, click the Add icon. You can also find questions from an existing question bank and add them to the question group. To change the number of questions to be picked from the group or to change the points assigned, click the Edit icon . To delete the question group, click the Delete icon . Previous Topic:How do I create a quiz with individual questions? Next Topic:How do I create a quiz by finding questions in a question bank? 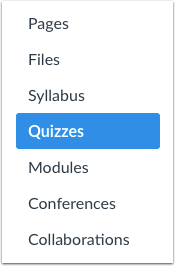 Table of Contents > Quizzes > How do I create a quiz with a question group to randomize quiz questions?